When I was a litter child, my family wasn’t rich at all, but I just remembered that no matter how difficult it was, my father and mother loved each other very much. They worked hard to bring me up and give the best to me. Therefore, the happy scene will never fade from my memory. Now, next weekend is my parents’ 25th silver anniversary. As their sweet heart, I plan to give a surprise to them with a silver anniversary DVD presentation. Perhaps you have the same idea like me to look for an opportunity to express your love or gratitude to your parents. Perhaps you just get married, and you want to give your husband/wife a surprise. Perhaps your mom’s birthday is just around the corner, and you have to prepare a special gift to her. Then you can follow my detailed procedures of creating parents’ 25th anniversary DVD presentation to create your own warm presentations. Pick out a conformable template from website, or you can refer to create a PowerPoint background of your parents’ silver anniversary presentation. As the saying “well begun is half done”, so does the good first slide mean to a good presentation. There are various styles of the slide, such as a sweet one, a vivid one, a Johnsonian one and so on. Therefore, you should decide the certain theme of your presentation. Take a look at the first slide of my parents’ silver anniversary presentation and you will get an idea of what you want. Save all your parents’ digital pictures and the scanned ones in a new document with a name of parents’ 25th anniversary photo album. Now you should arrange the order of the slides and add some descriptions for your parents’ pictures. The anniversary DVD presentation would start with your parents’ pictures when they were younger, maybe even children. This presentation will tell the love story of them from the past to day. It's usually very touched to see that a family begins with such a combination of our parents. Additionally, if you have siblings, you can ask some good suggestions from them. People naturally like to listen to songs, especially the nice ones. So you should choose a sweet song to insert into the presentation, or just a song your parents like. Furthermore, you also can add a significant video into the anniversary presentation which preserved by your parent. Before you insert the videos into the presentation, you need to transfer the videos from different resources to WMV, AVI format which can be accepted by MS-PowerPoint. Click here to view how to add various videos into PowerPoint. As we have spend much time to prepare this meaningful presentation, it is a pace race to make a perfect gift to our parent. So, we need to preview the effect of the dynamic parents’ 25th anniversary presentation. 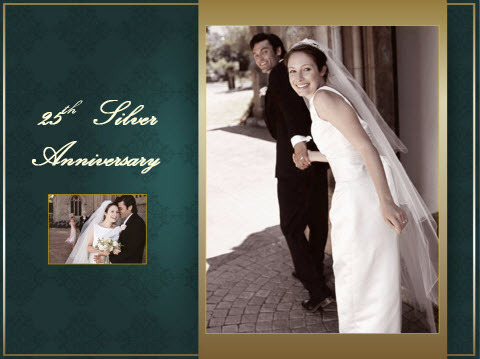 You have to make sure that the audio/video files played smoothly which you just insert to the silver anniversary presentation, and the presentation played automatically at the same time. There are so many benefits for us to convert the presentation to DVD. Now, you can use Wondershare PPT2DVD to transform the existing PowerPoint presentation to dynamic DVD or popular video movies with ease. See, you don’t have to spend a fortune to prepare a thoughtful gift for your loved ones, no matter for your great parents or intimate friends. So make a bit of effort to create a meaningful presentation and then burn it to DVD to show someone that you really care.